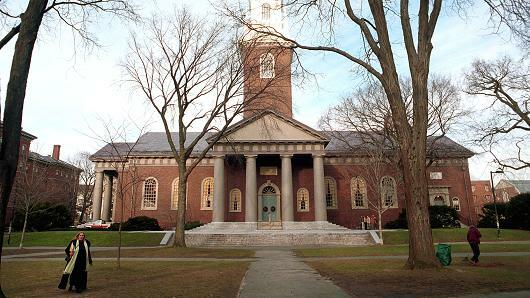 Harvard is looking for investment managers with expertise as short-sellers, as the world's biggest university endowment becomes more cautious about the outlook for financial markets. In its latest annual report, which showed investment returns fell to 5.8 per cent in the year to June, the $38 billion endowment said its managers had started to increase cash holdings and feared that some markets had become "frothy". "We are proceeding with caution in several areas of the portfolio," Harvard Management Company chief executive Stephen Blyth wrote in the report. "We are being particularly discriminating about underwriting and return assumptions given current valuations. "In addition, we have renewed focus on identifying public equity managers with demonstrable investment expertise on both the long and short sides of the market." Mr Blyth, a British-born statistician, was promoted to run the endowment last year after the resignation of Jane Mendillo, whose returns failed to keep pace with those at other Ivy League institutions. Mr Blyth unveiled an overhaul of Harvard's asset allocation process which is likely to be examined widely among other institutions. Endowments such as those at Harvard, and particularly Yale under its chief investment officer David Swensen, have been seen as pioneers in asset allocation and portfolio management theory. Harvard is ditching its traditional approach of assessing the likely risk and return of each separate asset class and instead focusing on five key factors: the outlook for global equities, US Treasuries, currencies, inflation and high-yield credit. The result is that Mr Blyth will be sharply scaling back the university's holdings of overseas equities, dialing up real estate and bond investments, and giving himself more flexibility. He set out a new promise to beat inflation by 5 per cent a year over 10 years. The 5.8 per cent gain for the Harvard endowment in the year to June 30 compared with 15.4 per cent the previous year, when global equity markets were rising more sharply. 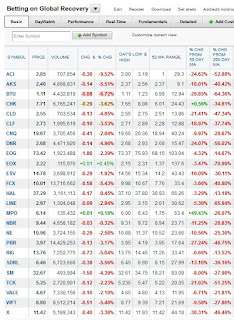 Its $6 billion allocation to hedge funds also held back performance, returning only 0.1 per cent. While disappointing hedge fund performance has led some big institutions, including the California public pension fund Calpers, to pull out of the sector all together, Harvard is understood to be happy with its hedge fund portfolio, which outperformed its benchmark in the five previous years. The endowment's real estate portfolio was its top performing asset, up 19.4 per cent last year. So, Mr. Blyth will scale back the endowment's holdings of overseas equities but dial up real estate and bond investments and is giving himself more flexibility. Interestingly, the real estate portfolio was the endowment's top performing asset, up 19.4 per cent last year, which makes me wonder if there's a performance bias attached to the decision to dial up this asset class while other big investors are dialing down real estate risk. "Real estate markets provide dramatically cyclical returns. Looking in the rear-view mirror in the late 1980s, investors generated wild enthusiasm for real estate as historical statistics dominated numbers for traditional stocks and bonds. A few years later, after the market collapse, those same investors saw nothing other than dismal prospects for real estate. poor returns nearly eliminated interest in real estate as an institutional investment asset. Reality lies somewhere between the extremes of wild enthusiasm and despair." The Harvard University Management Company, which oversees an endowment of $37.6 billion, the academic world’s largest, generated a 5.8 percent return for its most recent fiscal year, significantly lower than several of its rivals. The return, for the year that ended June 30, beats the preliminary 5.6 percent figure that Cambridge Associates released as the average for endowments over $3 billion that it tracks. Still, “the Harvard result was disappointing,” said Charles Skorina, owner of a company that recruits chief investment officers for endowments. Mr. Skorina noted that Harvard had consistently underperformed its rivals over the last few years despite having one of the biggest and most expensive endowment offices. While Harvard’s biggest rivals in the universe of large endowments — including Princeton and Yale — have yet to release their returns, several people in the endowment sector said that those schools were all expected to release results of well over 10 percent. The people spoke on the condition of anonymity. Massachusetts Institute of Technology, for example, just reported a 13.2 percent return. Bowdoin College, a far smaller school with a $1.3 billion endowment, this week reported returns of 14.6 percent. Still, results varied widely. The University of Texas Management, which has $26.6 billion to manage, reported that it had a weighted 3.5 percent return for its two funds. Weak returns in the market are expected to depress investment performance at schools where portfolios are limited to stocks and bonds. But schools such as Harvard have access to a range of alternative investments such as private equity, hedge funds and real estate. In the last fiscal year, private equity and real estate fared particularly well. Although Harvard did not disclose its asset allocation in its most recent report, it had roughly 20 percent of its assets in private equity in the 2014 fiscal year; Yale, by contrast, had about 33 percent of assets in that sector. Harvard’s decision not to provide its asset allocation numbers made it harder to evaluate the impact of allocation decisions on performance. And although Harvard outperformed the internal benchmarks it sets for itself in all but the “absolute” or hedge fund category, the outperformance may not necessarily have been as impressive as those at other endowments. There were, however, some savvy moves, such as eliminating investment in commodity indexes when such investments were posting steep declines. 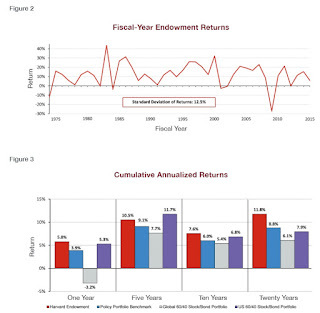 Endowment performance is crucial at all colleges because a portion of the returns are used to finance their annual budgets. Harvard relies on the endowment for roughly 35 percent of its yearly expenses. Still the Harvard endowment’s leadership team has had a lot of turnover ever since Jack Meyer stepped down as its head in 2005. Harvard had — and continues to have — a strategy in which a portion of its money is managed internally and a portion is managed externally by investment firms including hedge funds. It is the only large university to use such an approach. Most endowment chiefs allocate the school’s funds to outside managers. Before Mr. Meyer’s departure, some members of the Harvard faculty had complained that money managers who worked at the Harvard Management Company were paid enormous sums of money compared with academics. The negative publicity was said to be a factor in Mr. Meyer’s decision to leave, despite a stunning record. He was replaced first by Mohamed El-Erian who had been at Pimco. Mr. El-Erian left in 2007 to return to that firm. He was followed by Jane Mendillo, who had once worked at Harvard and then ran the endowment for Wellesley College, but she quit in 2014 after returns proved disappointing. She has since been replaced by Stephen Blyth, who was promoted to president and chief executive after many years at the endowment firm. Mr. Blyth had previously held posts as head of internal management and public markets. In a long letter released with the performance figures, Mr. Blyth signaled that he intended to keep with Harvard’s history of managing some of its money internally, but he suggested that he would make changes. For example, he wrote that he would aim to have his internal money managers work more closely with one another by tying their compensation not just to the assets each one managed but also how the endowment as a whole performed. Still, Harvard may not pay the same sums as private firms, which could lead to difficulties in attracting and keeping talent. You can read Mr. Blyth's long letter here. I think his proposed changes to the way managers are compensated is right on the money and here he's following the compensation model many large Canadian pension funds have successfully implemented. Sure, rich universities have the mother of all tax breaks but every single investment fund should post these figures. You will notice the standard deviation of fiscal year endowment returns in Figure 1 is 12.5%, which is a bit high but mostly owing to risks the endowment takes to achieve its return objective. More importantly, the long-term performance (ten and twenty years) over the domestic and global 60/40 stock-bond portfolios in the second figure is what ultimately matters and it's stellar (provided these returns are net of all fees and internal costs). While HCM seems satisfied with their hedge funds, the truth is small and large hedge funds took a beating this summer but the former were better able to navigate through this turbulence. As far as HMC's warning of market froth, I would agree that all assets are priced richly but some investors are betting big on a global recovery while others are warning of more pain ahead. You already know my thoughts. I'm preparing for a long period of global deflation but in the meantime there's plenty of liquidity in the global financial system to propel risk assets much higher. In the current environment, I continue to steer clear of energy (XLE), oil services (OIH) and metal and mining stocks (XME) and anything related to emerging markets (EEM) and Chinese shares (FXI). On the long side, I still like tech (QQQ), especially biotech (IBB, XBI and SBIO) and keep tracking what top funds are investing in. 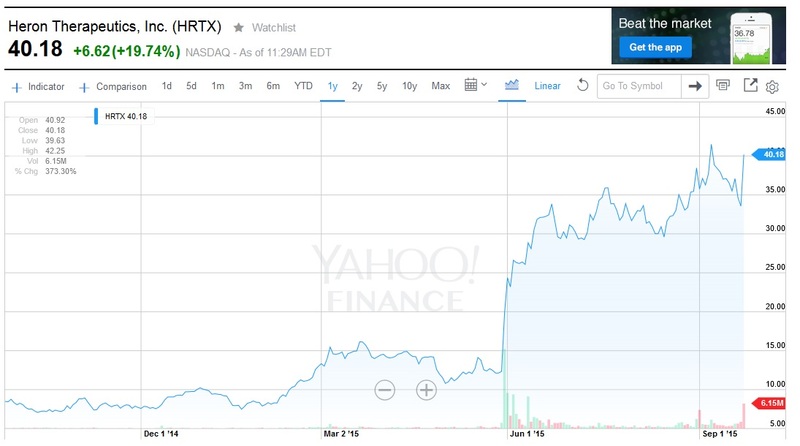 For example, today I noticed shares of Heron Therapeutics (HRTX) popped 20% after the company announced positive results from its Phase 2 clinical study of HTX-011 in the management of post-operative pain in patients undergoing bunionectomy (click on image). 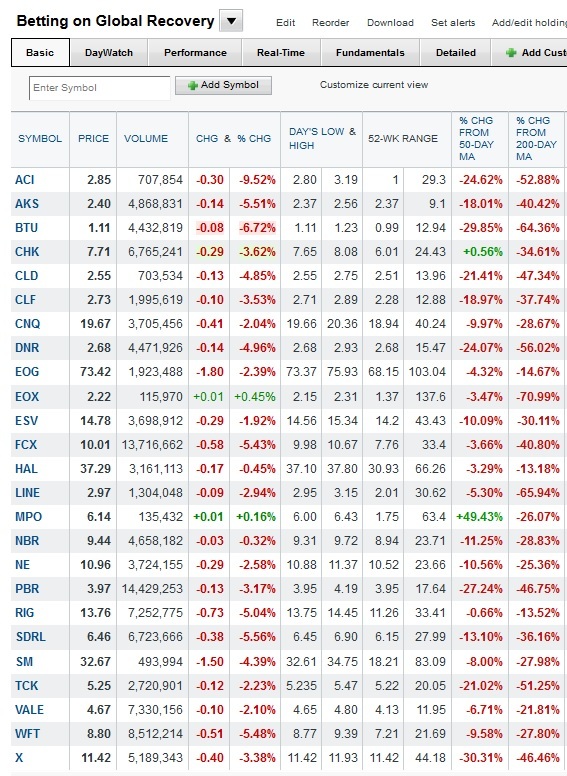 And who are the top holders of Heron Therapeutics? Who else? The Baker Brothers, Fidelity, Broadfin, Tang Capital Management, ie. the very best biotech funds. This is why I tell you to pick your spots carefully when investing in single biotech names, diversify and focus on companies where you see many top biotech funds investing at the same time. Still, investing in biotech isn't for the faint of heart and as I warned you in my comment on time to load up on biotech, it will be extremely volatile. Earlier this week, a tweet by Democratic candidate Hillary Clinton sent biotech shares plunging. It was much ado about nothing and she was right to blast the CEO of that drug company for price gouging. Below, CNBC's Meg Tirrell interviews Martin Shkreli, Turing Pharma founder & CEO who explains the spike. After public outcry, Shkreli backtracked and said on Tuesday he will lower the cost of the life-saving medication (controversy follows this guy). In the third clip below, Tirrell summarizes Hillary Clinton's statements on rising prescription drug prices. Listen carefully to Clinton's comments, she's hardly proposing anything radical and hasn't dissuaded me from holding on to my biotech stocks.